Remember the 80′s? Man, those were the days, right? Actually I don’t remember, I was born in 1984, so pretty much everything before 1990 is a big blur. But one thing I do recall is how popular the original NES video-game console was back then. If you remember you’re first Super Mario playing days I’m sure you’re going to love the tribute a group of Dutch students prepared for Nintendo’s legendary machine. 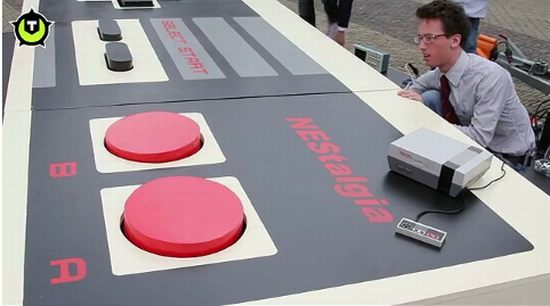 Electrical Engineering students from TU Delft, in the Netherlands, have created an impressive replica of the NES controller, 30 times larger than the original. The overgrown Nintendo Entertainment System controller was assembled in the town square and attracted a lot of young Super Mario fans eager to test the unique gadget, with their feet. Since the controller was 3.6 by 1.6 meters in size the only way to properly operate it was with your feet. So players just jumped on them and played Nintendo Classics like Tetris or Super Mario on a big six meter wide LED screen. Unfortunately, the largest functioning NES controller hasn’t gained a spot in the Guinness Book of Records, because there was no official delegation on the scene.